Wood Lake looks pretty much the same today, population 63 as of last census. Wood Lake wasn't too far from where my 16 coupelet resided for 25 odd years. Very possible that it could have driven through this town or even used this garage. Could this be a Ford dealership? The picture on the right has really got my curiosity going. 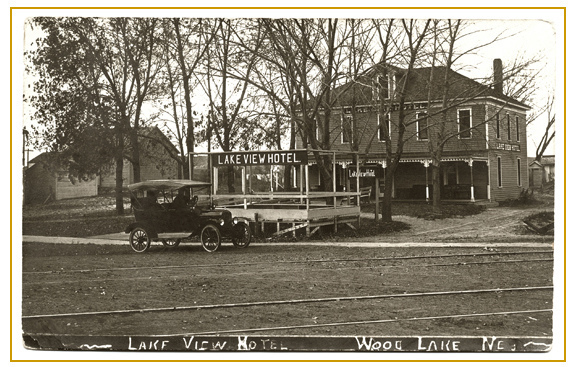 Wood Lake was a cattle town in the early 1900's with stock yards and loading chutes to take cattle to market. From where the original owner of my car lived to Wood Lake is seventy miles and he was a rancher. It's quite possible he frequented the town either on horse or in our coupelet. 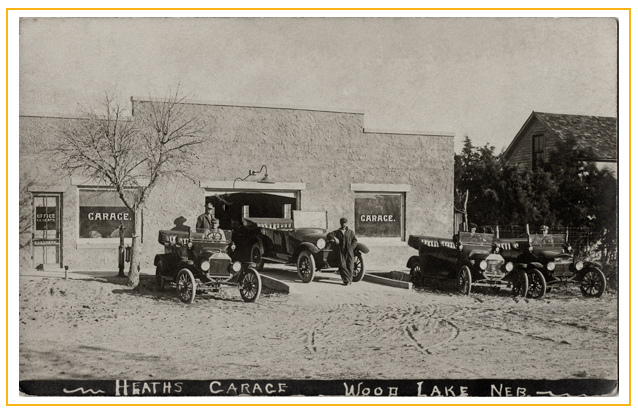 I found a village website for Wood Lake and emailed them a note along with the picture to see if they have any info on "Heath's Garage". If you had enough cattle together you will usually have a lake... of sorts. a small lake still remains on the West edge of the village. railroad line that later became the Chicago & North Western Transportation Company. the low-rolling hills covered with native grass made it ideal cattle-raising country. whistles and noise of the cowboys, and the bell of the trains could be heard day and night. north of Wood Lake. Today, only the chutes remain and are utilized by local ranchers. residence, coupled with long distance calling available for users. 6, 1964 this church burned down. Services then were held in the Assembly of God building. towns with more variety and competitive prices. war time. Some of the Wood Lake residence moved to work in war-related factory jobs. Many did not return and several were killed in action. left only one general store, and it burned down in 1974.
occasion, a free barbecue and street dance is held in July. is the place to visit. Some would say that the Wood Lake Cafe is where "rumors and stories"
On September 23, 1862, United States troops, led by Colonel Henry Sibley, defeated Taoyateduta (Little Crow III)'s Dakota force at the Battle of Wood Lake. The battle marked the end of the U.S.-Dakota War of 1862.